Jenkins was born to a wealthy family and was a child piano prodigy who performed at the White House during the Rutherford B. Hayes administration. She had a passion for music and a burning desire to perform, but her father, a successful lawyer, disapproved. She rebelled by eloping at age 17 with her first husband, Dr. Frank Thornton Jenkins. The marriage was short-lived. She taught piano, but after an arm injury forced her to stop playing, she moved with her mother to New York and began to sing. She met a Shakespearean actor named St. Clair Bayfield, seven years her junior, who became her common-law husband, manager and protector, keeping critics, scoffers and mockers away from Florence's “invitation-only” recitals. It was arranged so that Florence only sang for “music lovers,” i.e., audiences who would cheer and applaud, often more loudly to cover any boos and jeers. The loyalty of her audiences was based on the fact that she was a generous patron of the arts, and that it was considered novel fun to hear her terrible singing, the incredible swoops and bizarre, failed attempts to hit high notes. It is an amazing thing to behold . The enduring charm of Florence Foster Jenkins, and the thing that makes her recordings still listened to today, is her sweetly naïve belief in her own talent. A famous photograph shows her wearing angelic wings, part of a tableau vivant she produced based on the painting Stephen Foster and the Angel of Inspiration. One of many such hokey tableaux Florence created, it serves as our introduction to to her as the bewinged Florence is awkwardly lowered on wires onstage to inspire a “Stephen Foster” character to write “O! Susanna” at a performance for her own musical society, the Verdi Club. Elderly society ladies in elbow-length gloves applaud wildly. For her next act, Florence dons a Valkyrie helmet for a Wagner aria. Her devoted fans present her with a diamond watch in appreciation for her 25 years of service to New York musical culture. “Music has been, and is, my life,” she declares. She is in her glory. Cleverly, the film does not introduce Florence's singing until much later, and it's heard only sparingly. Part of the film's magic is that you, the audience, feel a little bad for laughing at her indescribably dreadful bleating. You become as one with those 1930s listeners who held back laughter and cheered out of pity, amusement or genuine affection. 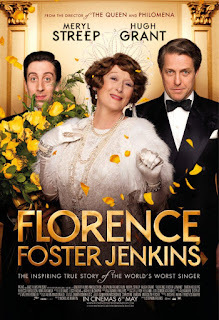 Nicholas Martin's sensitive script and persuasive performances by Streep, Hugh Grant as her doting husband and Big Bang Theory's Simon Helberg as loyal “FloJenk” accompanist Cosme McMoon, create enormous sympathy for this kind, well-meaning, if deluded lady. FLORENCE FOSTER JENKINS is as much a story about relationships as about music, or attempted music. The portrayal of Florence and St. Clair's ambiguous marriage is an interesting centerpiece. St. Clair, handsome in his tuxedoes, fulfills his failed acting ambitions by giving dramatic recitations at Florence's concerts. He is her caretaker, tenderly tucking her into bed and removing her curled wig to reveal her bald head. But is he also a gigolo, leaving his wife to meet his pretty mistress, Kathleen (Rebecca Ferguson), who's stashed in an apartment for which Florence pays the rent? Grant, so much more interesting now that he is older and his face more attractively etched, toes this ambiguity deftly. He is the movie's most compelling character, doting on his elderly mate in a way reminiscent of Ralph Fiennes' dashing concierge in THE GRAND BUDAPEST HOTEL. St. Clair, who dances a mean jitterbug, has all the markings of a bounder, but as the story develops, we learn that he truly loves Florence. Their marriage is platonic, supposedly due to the syphilis Florence contracted from her first husband (her baldness was due to pre-penicillin treatments for the disease). “Ours is a very happy world,” St. Clair tells Cosme, the soft-spoken pianist he has just hired to be Florence's accompanist. It is a happy world of fantasy, which requires elaborate bluffing and baffling and bribery to maintain. There is also, at one point, a bathtub filled with potato salad, her favorite dish. St. Clair's tireless efforts can't always protect Florence, his “Bunny,” from herself. While he's away with his mistress on a “golfing” weekend, Florence, inspired by the coloratura Lily Pons, decides to book a concert at Carnegie Hall. In a patriotic fervor, she gives away a thousand tickets to members of the military. This time, St. Clair can't exclude hooting soldiers and sailors or bribe Earl Wilson of the New York Post to refrain from writing a scathing review. The concert, attended by celebrities including Tallulah Bankhead and Cole Porter, provides the film with a wild, almost horrifying climax. I am often reluctant to enjoy the ubiquitous Meryl Streep and her annoyingly protean shape-shifting. Are there no other actresses in the world? But she brings welcome nuance to a character who might otherwise be portrayed as a cartoon. There is a wonderful scene in which she invites herself into the messy hovel of her accompanist, Cosme, and admonishes him for not washing his dishes. She offers to wash them, in his stained sink, if he agrees to play something for her. While he plays a piece of his own composition, she reveals some things about her past and sits down with him to play a Chopin etude. This kind of subtle character revelation should be a model for anyone wanting to write for movies. It's truly lovely, as are the film's impeccable period production design, costumes and settings. 4 out of 4 stars.